In this short treatise, The Forest: An African Traditional Definition, Ekpe Inyang attempts to highlight certain cultural belief systems that can be exploited by modern, Western conservationists working in Africa. He notes that too often, modern conservationists adhere to a strict eco-centric approach at the expense of anthropogenic (cultural) considerations when dealing with the relationship between the conservation of nature and the livelihoods of humans. The backbone of Inyang’s book is his claim that systems of belief influence the treatment and use of natural resources. The cultural practices of indigenous groups are deeply influenced by their natural environment, and they affect the way groups care for and protect nature. The Forest: An African Traditional Definition outlines various traditional beliefs that influence the protection of nature by some African ethnic groups. Using the forest zones of Cameroon, Inyang outlines how certain ethnic groups in those zones may designate a forest as sacred either because the forest is regarded as the home of their ancestors, or it is reserved for specific traditional cults or secret societies, or it is a place of worship where ceremonies and rituals are performed. As a result of the designation of an area of forest as ‘sacred’, the forest is protected and encroachment and usage are restricted. Totems within a culture may also play a part in the protection of the natural environment. A creature may be regarded as a totem if it is viewed as sacred, or if under certain circumstances humans are thought to have the ability to transform themselves into that creature. Animals that are commonly used as totems – elephants, chimpanzees, leopards, crocodiles, bush pigs and pythons – are easy prey for hunters. Therefore to protect the lives of totems (humans) certain areas where these animals live are protected. Inyang gives the example of Asu Hill Forest at Nguti, in south-western Cameroon, which is home to a group of chimpanzees considered to be totems and who reside there undisturbed. Certain taboos and customs also lead to the protection of animals. For example, for the Korup ethnic group and most of their neighbours, it is forbidden to kill a two-headed snake, which symbolises twins. Tree species thought to be inhabited by spirits are left alone; it is believed that misfortune will befall the feller of such trees. The cultures of people who dwell in the forest draw inspiration from it – in their paintings, myths, folktales and songs. The forest is also appreciated for its medicinal benefits, and plants from the forests are used in the treatment of different types of ailments, from minor cuts to major cardiac problems. 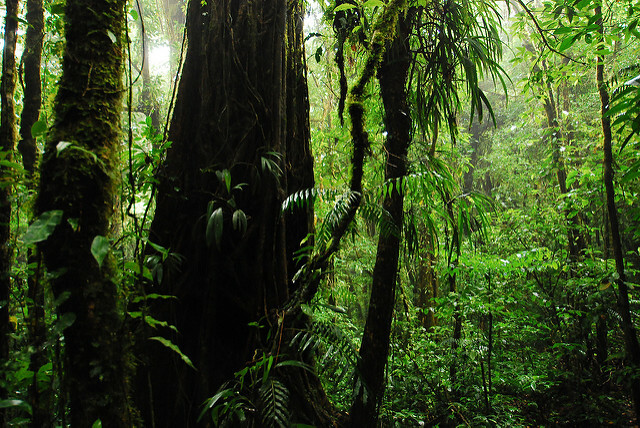 Further contributing to the protection of forests is the fact that the forest is regarded as the communal property of the group, and individuals selling a part of it off is frowned upon. Cultivation of the forest is allocated and restricted to families that make up the group. This ensures the preservation of the natural state of the forest. The book provides a good overview of certain cultural practices that are connected to, and lead to the preservation of the natural habitat. However, a major let-down of the book is the absence of suggestions on how modern conservation practices can benefit from the several traditional beliefs discussed in the book. For example, a discussion of how conservationists can tap into the idea of the sacred forest to prevent commercial logging that would destroy large expanses of forest would have been illuminating. There is no consideration of the pressures of poverty and development, which may cause groups to encroach on the forest, and ultimately destroy it through overexploitation. In addition, the description of indigenous practices in the treatise is implicitly based on the faulty notion of a static culture that has remained unperturbed through time. The traditional practices of most African ethnic groups have been affected by colonisation and now by globalisation. Are the traditional beliefs mentioned in the book still held in very high regard, so much so that they can be used to further conservation goals? Nothing in the book provides an answer to that important question. At one point in the book, Inyang makes a passing reference to ‘the good old days’, in his discussion of Deket d’Ekwe, which literally means Pool of the Leopard in Korup. Deket d’Ekwe is believed to be the home of the tribal totem, a python, whose magical smell attracted fish to the area, and no one dared fish or swim fearing an attack from the leopard or the python, but are we still in the good old days? With respect to the identification of flora and fauna, the author could have been more specific in his descriptions throughout the book. Inyang often makes reference to plant species without a specific name being given. It would have been better if the traditional names of species, their scientific names and common western names were given. This would have added to the richness of the book. There is an African sense of conservation beyond curses and misfortunes. There are practices in place within African cultures – the enrichment of the land, the regulation of agricultural practices – that ensure the survival of humans, and the preservation of the natural environment. This could have been explored in the book, and added to its richness. The Forest: An African Traditional Definition falls short of its intention. While it gives a broad overview of traditional concepts, and the dynamics of nature and culture in an African context, it does not effectively tie this to the practical nature of modern conservation, and it ignores the pressures these cultural beliefs have faced and continue to face from globalisation and development.